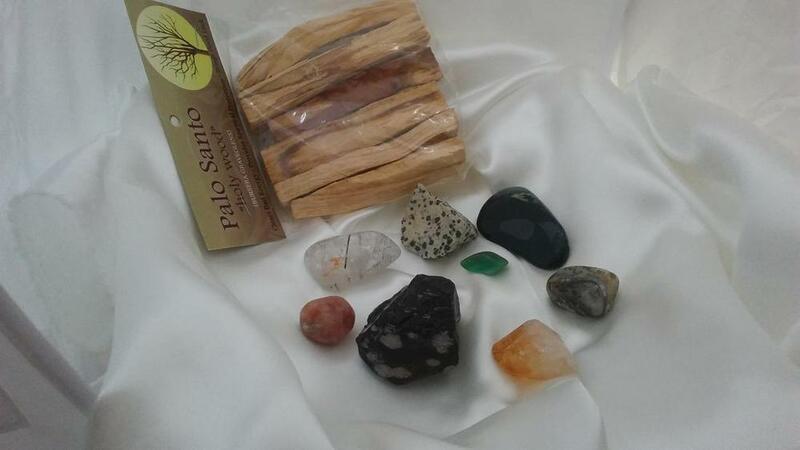 Deluxe Collection - Bloodstone, Chrysoprase, Citrine, Jasper, Sunstone, Tourmalated Quartz, Dendritic Opal, Snowflake Obsidian, & a Abalone Shell & Sage Bundle or a Palo Santo Pack. Stimulates dreaming. Powerful revitalizer. Gives courage & teaches you how to avoid dangerous situations. Encourages selflessness & idealism. Assists in acting in the present moment. Grounding & protects. Draws off negative environmental energy, helping to overcome influences such as geopathic or electromagnetic stress. Calms & revitalizes the mind, dispels confusion & enhances decision-making. Reduces irritability, aggressiveness, & impatience. Excellent blood cleanser & a powerful healing stone. Detoxifies the liver, intestines, kidneys, spleen, & bladder. Regulates & supports blood flow & aids in the circulation.